So, this school holiday is pretty busy for us. With swimming competition on the go, one boy has to stay home for training while his brother went to Rottnest Island with friends for couple days. I know, it’s tough life for a swimmer hey! On Thursday I thought I would take the boy to the city for a bit sight-seeing after his morning training. It was a bit cloudy day but at least it didn’t rain. We very rarely venture out to the city, I can’t be bothered with parking and traffic. This time we took a train which is only 10 minutes to the city. As per his request, we visited City of Perth Library. This library is located in Hay St next to the Perth Town Hall. 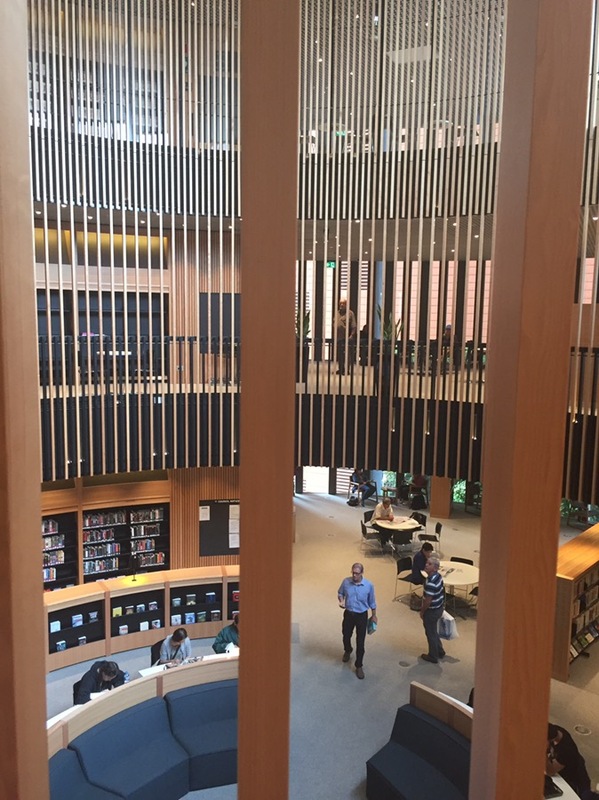 The library has a circular design with seven floors, glass façade and stone clad columns. This new brand library, opened at 1st March 2016. I really love this library. It’s so cool with all the books displayed very neat. At the ground floor is a little café selling food and drinks. Then there is mezzanine and terrace floor. At the terrace, you can sit outside overlooking the Swan River and Elizabeth Quay. There is one floor especially designated just for DVD/video collection where you can lend or watch there. And at the mezzanine floor there is room special for mums and their little kids, complete with bean bags, changing room for babies, etc. How cool is that! view from the terrace, look at that cloud! The building includes the 13 meter tall vertical garden, the tallest in Perth, with more than 3500 plants. I wish I was back to my student life again, because I think it’s so cool to study in this library or just reading books in peace and quiet atmosphere! keren sekali library-nya ya..saya termasuk yg suka baca, jd seneng bgt lihat library sebagus ini. Sayang di Indo, apalagi Medan, tempat tinggal saya, belum ada library sebagus itu. Gede banget perpusnya, mba Ria.. Pasti komplit yahh.. Dan interiornya keren.. di Wellington juga dari luar kelihatan gede banget tapi gak sempat masuk. Nyaman banget Den dan lengkap juga fasilitasnya sampai untuk ibu2 yg punya toddler/baby pun ada ruang sendiri, jadi ga mengganggu yg lain. itu yang saya salut dari negara maju ini dalam mendesain mbak. keren! senang saya melihatnya.